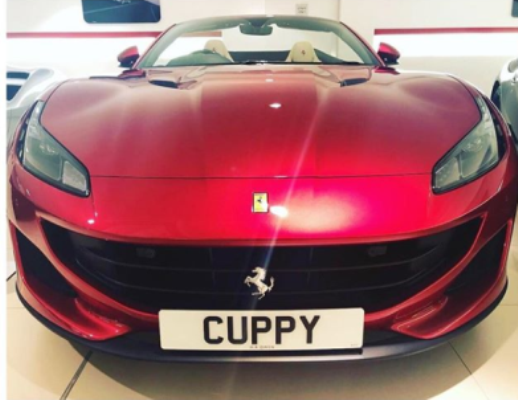 Nigerian disc jockey, Florence Otedola (DJ Cuppy), has shared photos of her newly acquired Ferrari Portofino worth N75 million. Cuppy, who is the daughter of Nigerian business tycoon, Femi Otedola, is also a producer and remixer. The 26-year-old DJ, who is a huge fan of exotic cars, had in January acquired a Rolls Royce Phantom worth N162 million, which took 13 months before it got to her. The DJ had in January, 2015 featured on the cover of the Guardian Life Magazine and in March 2015, Cuppy was named the official DJ for the 2015 Oil Barons Charity in Dubai, and became the first African act to perform at the event, as well as featured in the 2015 April/May issue of Forbes Woman Africa. She visited Nigeria, Senegal, Ghana, Kenya, Tanzania, Rwanda, Uganda and South Africa. The “Cuppy Takes Africa” tour included performances, major artist collaborations, and charitable engagements supported by GTB Bank and the Dangote Foundation in 2015. Cuppy had in March, 2018 released “Vybe”, her second official single. The song features guest vocals from Ghanaian rapper Sarkodie.